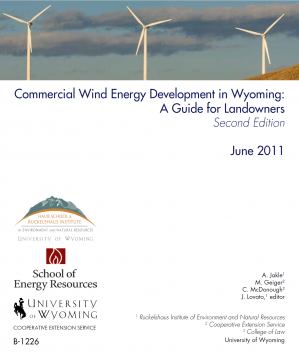 The updated Commercial Wind Energy Development in Wyoming: A Guide for Landowners, 2nd edition offers insight into ownership/leasing structures, incentives, enforcing existing contracts, and recently passed laws impacting wind energy development. The Guide is provided as a service to the state by the University of Wyoming Ruckelshaus Institute for Environment and Natural Resources, School of Energy Resources, College of Law, and Cooperative Extension Service. The E3 Wind Costing Model is intended to demonstrate the related nature and relative impact of various cost drivers including capital costs, performance, financing, transmission, state and federal taxes, and others on the delivered cost of wind energy. Energy and Environmental Economics, Inc., (E3) populated, and the University of Wyoming updated, the model with the best available data regarding project cost and performance, and with a plausible set of assumptions regarding project finance and power purchase agreement structure. The model was originally requested by the Wyoming Infrastructure Authority to inform policymakers about the various factors influencing the cost of Wyoming wind energy. However, E3 and UW recognize that economics will vary on a project-by-project basis, and that key inputs will change over time. Therefore, we are making the model available so that stakeholders can verify the model’s results and substitute their own inputs and see how the model results change. Version 2 of the model was updated at the request of the State of Wyoming Governor’s Office with input from local and state government and the wind energy industry. A specific list of parties involved is available by contacting the State of Wyoming Governor’s Office. If you have questions or comments concerning this process or the design of the model, please contact Colin McKee. The E3 Wind Costing Model, Version 2, was developed by Energy and Environmental Economics, Inc.
Nine Wyoming counties have enacted regulations for wind energy development within a land use plan and/or zoning regulation. Click on the county name to access the regulations.